Club, Endurance and Isle of Man racer, been riding bikes since 1970 something, got the bug sitting on the back of my dad’s 400 Four. First ride was an Italjet followed by RM80 and YZ125 dirt bikes, current bikes range from agricultural to exotic. Writing about bikes for four years. Have you ever wondered what it would be like to ride a 500cc GP two stroke? I have. It all started when I was sixteen years old, riding a Yamaha DT50 on a dual carriageway. Teasing out that all important last couple of miles per hour, I was practically laying down flat, chest on tank, elbows above my head, feet hooked over the rear indicators reducing all the drag that I could (think Rollie Free with longer trousers and more acne). I remember polishing the front of the bike and even my helmet with Mr Sheen to reduce the frictional forces to cut through the wind. Flying along on my comical trajectory, a max-ed out Suzuki RG500 gamma blasted past. I swear it took a layer of paint off my bike with none of my extreme slip streaming methods. The wind blast literally pushed me onto the hard shoulder. As I was recovering from the shock I watched the bike disappear off over the horizon and I thought to myself, I have to get one of those. I never did. But I did develop a fascination for proper 500cc Grand Prix two-strokes. Turns out I wasn’t alone. Meet Alan Philips, who has the same feelings as I do about these things, except he went a few steps further and built his own . I first met Alan, who has his own two stoke enthusiast page on social media called Two Stroke Heaven when he was riding his bike, which he calls an RS500 at a Silverstone. So what is a RS500? Alan wanted to build the best a two stroke machine he could. He wanted the power of a modern Supersport 600cc with all the two stroke character and excitement. The bike needed to have GP500 handling (or better) all weighing in at under 120kg giving the bike a massive power to weight ratio advantage. The RS500 weighs in at least 50 kg lighter than a modern 600. Alan combined the best parts from two bikes, a frame from an Aprilia RS250 and the engine from the power house Suzuki RG500. The bike was built by RG500 specialist Mark Dent. Mark’s brief was that money was no object, just build the ultimate bike. They thought it would take a few months but in total it took two painstaking years. That’s the cost of this level of attention to detail. “The biggest challenge,” Alan tells me “Was was getting the custom hand made titanium exhaust to run correctly.” The exhaust is a working piece of noisy art. Every component on the bike looks bright, new looks like it’s just delivered from the factory racing team HQ. You won’t be surprised to hear that all the bolts are titanium. The engine is fully tuned and has been bored out to 575cc. There are billet covers and removable cylinder head domes. Inside, the engine has a low-inertia generator, forged pistons and cranks. Feeding the thirsty beast means that big bore carburettors were needed. Even the carb covers and filters have been hand crafted. Alan explains he could have gone for a bigger carb but that would have meant the air filters would have stuck through the side fairing so he compromised with the big bore. There are two fuel taps on the tank. One on either side, feeding all four carbs on the square-four two stroke motor. If the bike is leant over to extreme angles and running low on fuel, it could run lean and seize the engine so they have run fuel from both sides to the carbs. On the full power map, the bike produces 127 bhp. Alan agreed to let us ride his bike and share the experience with you. 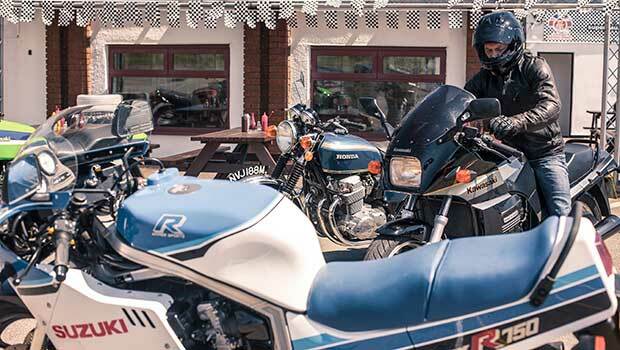 We booked a track day at Cadwell Park with Classic Bike Track Days. It’s a friendly paddock and a great environment to test the bike. Classic Track Day splits the bikes by category, which means we could ride with other two strokes in the group they call pocket rocket. We needed a camera bike too so Alan brought another of his bikes, a tricked up RD400. The plan was for me to follow on the 400 filming Alan for the first session. We did three steady sighting laps, but on the fourth lap before even stretching the legs on the 400, the bike lost power there was the tell-tale splutter and then the engine seized. Back in the paddock, it was easy to see the reason for the problem; oil was running out from the head. A blown gasket meant the bike had ben sucking air making the engine run lean, which is fatal on a two stroke. Kicking the bike into life brings that wonderful two stroke soundtrack. I was expecting to hear a rattle from the Nova dry clutch but it runs really quiet. Before you even turn a wheel you also notice that the bike has the turning circle of an aircraft carrier, from the centre to full lock to lock it can’t be more than 35 degrees. I made a 45 point turn before heading down the paddock road where all the other two stroke warriors were lined up. My first impression was that the bike was too small for me. The bespoke sub frame would need to be extended, or at least a larger higher profile screen fitted for me to be able to get a full tuck position and my head behind the screen. I am taller but assured the dimensions were perfect for Alan. On track I bumped my face on the screen a few times but it was a small price to pay. The compact dimensions just made the bike handle sweeter. The first few laps were an absolute treat, I left my ear plugs out so I could take in all the sound. I liked that so much that I left them out for the next session too. The bike is so light and turns so quickly, at first where I was aiming for the apex I found myself riding around the inside of the corners. I had to recalibrate all my inputs and really work hard to get the best out of it. You can just turn so much later – modern heavy four strokes have numbed our riding. The bike is the fastest turning best track handling bike that I have ridden. Further weight reduction is made by having carbon fuel tank. The tank is painted leaving the Yamaha decals revealing the carbon. The carbon BST wheels also go a long way to shave weight too, lighter wheels with less centrifugal forces make for quicker direction changes too. I asked Alan if he intended to paint the wheels orange, he gave me a cheeky smile and said ‘’no, paint ads weight’’ He also said he could have saved a ton of money on all the titanium if he had gone on diet instead. I debate buying new larger size leathers every spring when I can’t zip them up after my winter hibernation. Ultimately I tend to go for the diet option myself. The modern MotoGP spec Brembo mono block calipers, braided hoses and Brembo master cylinder have more stopping power than most modern litre supersports bikes. The faintest input on the lever had the bike almost standing on its nose. You could get the bike slowed and turned on a six pence. The RS slows quicker than a modern day supersports 600. The best way to make good lap times on a two stroke is to keep the revs up and carry a higher corner speed. Alan had warned me not to change gear in a corner on the power band or the bike may spit me off. As I got used to the bike I was confident changing gears with the bike leaned over, it was easier if the revs were high in the power band. There was a slight fuelling issue on the bike on the day. Occasionally it bogged down when I was riding up hill. There is an up hill section after the first straight at Cadwell. When I geared down and opened the throttle it would either bog or power up through the first couple of bends. At first I was not sure what was causing the problem it might have been the mapping or fuel feed to the carb. As the problem was only evident riding uphill I thought was more likely to be the level of fuel in the carb. This made the already really exciting two stroke more exciting as it was more un-predictable. Guy Martin who was at the trackday testing for the Spa Classic Endurance Race and his mechanic popped over to take a closer look at the bike. They both thought the problem was with the fuel level in the carb. They suggested making a modification in the carb. Alan called Mark Dent, he said this modification had already been made. He also said the Aprilia RS250 frame sits at a different angle to a RG500 frame. The 250 has at least another 10-degrees angle to it. This meant the carb would also be leaned over by another 10 degrees, the extra angle combined with the incline of the hill meant so it would not hold the required amount of fuel. To fix the problem the angle of the carb would need to be changed. This also meant the bike ran the same risk the RD400 suffered earlier in the day when it was running too lean and seized. Session one had the bike set on the full power map (which demanded more fuel) second session I set the bike to the road map (with less demand for fuel) it was more predictable. I couldn’t help but smile on this bike. The daft grins start as soon as you look at it and only finish when the session is over. I was like the cat that got locked into the cream factory. The RS500 is fast. Obviously. All that unpredictable power and razor edge handling make a most exciting exhilarating bike. The trick parts, and the hand made titanium expansion pipes are truly things of beauty. Every detail is surgically correct; this bike is a rock star in the paddock. It was hard to film the bike as enthusiasts trying to get a closer look or photo of the bike kept wondering into frame. Even the course car driver made the effort to come over and tell us that the bike sounded epic on track. If you have a special bike that you think is worthy of a review with the BikeSocial team, leave a comment with details of your bike and we will get back to you. The most important British bike ever?